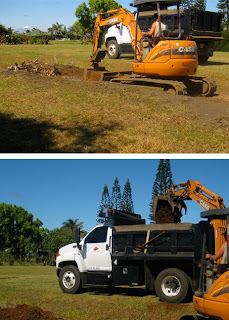 This has been an eventful week with the excavator here... and it's not over yet. 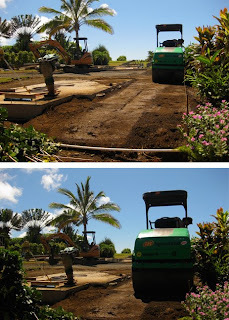 It all began on Monday with our excavator showing up with lots of excavatory toys that we immediately became envious of. As he set into finding the "grade" we soon realized this was going to take longer and COST MORE than we expected... NATURALLY! But it was rather painless and we've had a great team of workers so far. 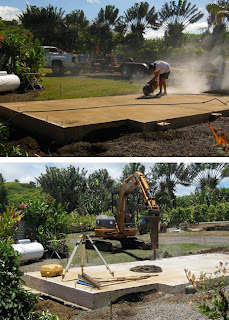 Sawing into the existing slab to check the thickness of the footing and then jackhammer it away. 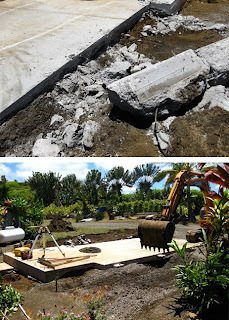 The cut lines into the slab before the jackhammer fell. 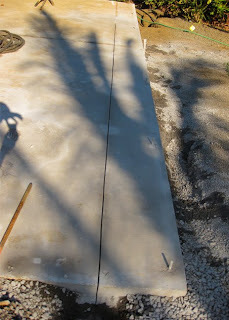 Turns out the slab was pretty thick which works in our favor. 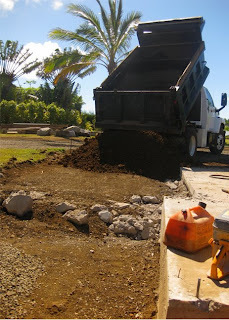 Then the back hoe moves it and starts to remove some of the gravel before we can establish the grade needed to pour upon. Excavator Mike, establishing the grade with his fancy grade measuring tool. 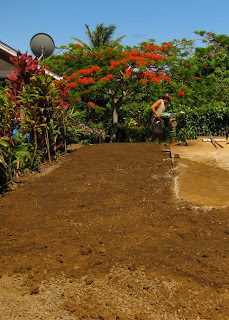 We thought that we were going to have all this extra dirt once we dug the new footing trenches, but turns out we were short. We ended up pinching some from the large pit in the far back part of the property. Excavator Mike again using a extra fancy tool for packing the dirt in the smaller, hard to reach parts of the site. And here he is using a giant roller that not only rolls, but vibrates and sprays water. 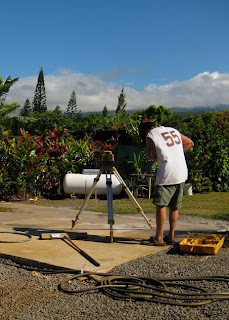 Once the earth was all packed and the footing lines marked, what else would you expect Mike to do? Yes he went in and had to dig out portions that he worked so hard to pack. 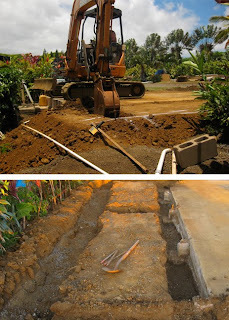 These trenches will be the perimeter and will support the exterior walls. And being that we are having a 2nd floor on part of this structure, the footings need to be even thicker. With all Mike's work done, Jason the Mason came by and dropped the lines for the wooden forms he will be placing on Friday. 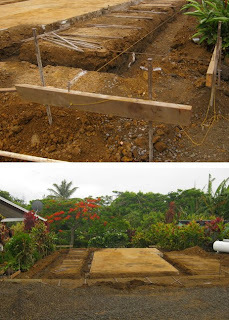 After that... some plumbing and electrical lines, then a quick inspection by the county, then the concrete slab gets poured. yes, tell your husband to fire away with the questions. we'll try to answer anything we can.